Here we are on the first Wednesday of a brand new month…March. The winds will blow, Northerners will delay packing away their winter coat and what could possibly be the most party-ing holiday of the year will happen…Saint Patrick’s Day. Anyone who has ever been in Manhattan on St. Patty’s Day knows exactly what I mean! Naomi Blackburn will help you get ready to party with a month long celebration of Irish Specialties…both alcoholic and in a few cases non-alcoholic libations. I am hooked on a show on Spike TV called Bar Rescue. In this show, Jon Taffer brings in experts, including himself, to evaluate and turn around under performing bars/restaurants or “Pub and Grubs”. One part of the show is mixologists developing new drinks for the “revamped” bars. On one show, he described an Irish drink he had developed and the way he described it sounded delicious. The problem..he never give the full recipe. As the mixologist gave two of the ingredients, lime juice and ginger, I knew that I wanted a concoction with those two ingredients in it. What did I come up with…The Irish Beauty! 1) Place first 4 ingredients in a shake with ice and shake for 60 seconds. 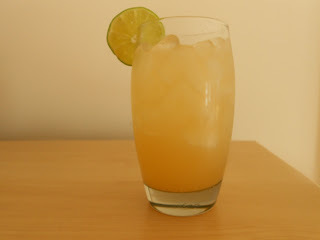 2) Pour into a glass which has a large amount of ice in it~you want this drink COLD! Hi Bette and Naomi. I watch that show too. Your drink sounds quite tasty. Thanks, Sherry! Yeah, it has inspired quite a few concoctions on my part!